We knew the Bulls would miss Derrick Rose’s scoring and ability to make big plays. And it was obvious again in Monday’s 101-95 loss to the Boston Celtics when the Bulls came back from a 13-point fourth quarter deficit to within three and then missed five shots and committed three turnovers. Sure, but who knew Rose was such a great defender. Because it was the Bulls’ shaky defense which was the ultimate culprit in the loss, the Celtics shooting 50.6 percent and becoming the first team in 16 games, since last April, to score more than 100 points against the Bulls. “Yes, we did (have defensive issues), 58 points in a half,” noted Bulls coach Tom Thibodeau. Asked about the better results in the fourth quarter, the only quarter the Bulls outscored Boston, Thibodeau said: “We tried. It’s just seven games, and the Bulls fell to 4-3. Omer Asik, who had another big game for the Rockets, is gone. But he played only 14 minutes per game last season, and often not in the second half. Yes, there is a new bench group. And it does take time to learn defense, which requires acute teamwork. But the numbers are alarming for a defensive guru like Thibodeau. Last season, the Bulls were first in rebounding, first in fewest points allowed per game, second in lowest opponent field goal percentage, third in lowest opponent three-point shooting percentage and third in blocks. This season, the Bulls are just another team on the defensive end thus far. They are 10th in opponent field goal percentage and blocks, 14th in three pointers allowed, 10th in rebounding and sixth in opponent points scored. The numbers are reasonable, but hardly exceptional. And nowhere near good enough to make up for the absence of Rose on offense. Yes, the Bulls received a blow with Kirk Hinrich missing the game with a hip/hamstring/glut injury as Hinrich is the team’s best perimeter defender among the guards. Hinrich remains day to day and uncertain for Wednesday’s road trip opener in Phoenix. Yes, Thibodeau’s demands and coaching enables the Bulls to pull back in a game like Monday’s in which Boston seemed any minute for three quarters to make it a blowout. The Bulls never led and the Celtics led by double digits at some point in each quarter and still by 13 with about 10 minutes left. But the Bulls began to trap in the backcourt some, pressure more as Thibodeau went primarily with a defensive unit without three starters, Carlos Boozer, Richard Hamilton and Nate Robinson. “Down the stretch, I wanted to do some trapping and get some more energy,” said Thibodeau. “So I went with Taj (Gibson) and Marquis (Teague) to help us in that area.” Jimmy Butler was in as well. 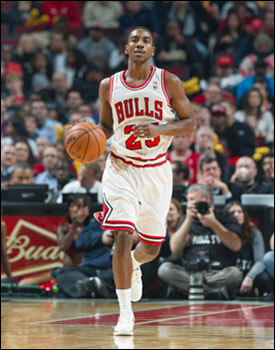 If not quite a savior, Teague had by far his best game with the Bulls with five points and two assists in 18 minutes. He did get beat on a key play with 41.9 seconds left and the Bulls trailing 95-93 after Luol Deng played the Rose role again as close as anyone could on the Bulls with a driving layup on the way to his game high 26 points. Boston coach Doc Rivers runs some of the best plays out of timeouts, and for the second time in less than two minutes and desperately needing a score, Kevin Garnett provided a second cross screen for Rajon Rondo and dove for the basket for a lob pass and dunk from Rondo. I’m sure Thibodeau did as he doesn’t miss much. But rookie point guards do, though the Bulls probably would have long been out of that game without Teague replacing Robinson, who was being dominated by Rondo. It’s no shame as Rondo is becoming as good as there is in the NBA at point guard. He leads the league in assists and had 20 points, 10 assists and nine rebounds Monday. He stretched his streak of consecutive games with 10 or more assists to 31, the longest in the NBA since John Stockton had 37 straight in 1989. But it’s hardly like the Bulls aren’t a match for this Celtics team that most projected second in the East behind Miami. Sure, not having Hinrich was a big loss given he’d be the defensive point against Rondo. But it’s been more than that with the Bulls, who did tighten up some late. Though with the likes of Gibson, Butler and Teague finishing the game it limits what the Bulls can do offensively. Of course, as Thibodeau suggests by his rotations, if he goes with Boozer, Hamilton and Robinson perhaps their scoring won’t be enough if they’re giving up that many more points. That’s Thibs or Shakespeare. I always mix them up. That’s because Thibs’ game is usually one of order that has come to disorder many times already this season. Especially early in the game as Rondo was in danger of being taken into custody by transit police. After all, he looked like he was jumping turnstiles the way he blew past Robinson for layups. The Bulls were beaten both in inside and fast break points, which wasn’t cleaned up much until late in the game. That was one of the positives for the Bulls as Teague actually settled things down some and did a much better job with the Boston guards. Reserve Leandro Barbosa as well had been getting to the basket so freely it looked like a pregame layup line. It’s the kind of stuff we’ve basically never seen since Thibodeau became coach. And while he can make in game corrections, falling behind like that becomes fatal for a Bulls team without Rose: Thibodeau has to go defensive to halt the offensive onslaught. But then the Bulls have to be almost perfect offensively in asking more of Deng and Noah with Deng going more than 45 minutes Monday. Deng has been terrific and easily outplayed Pierce Monday, often beating him off the dribble as well. Deng is averaging 18.9 points and 23 over the last four games. He also added 11 rebounds and three assists Monday. He and Noah combined for 18 of the Bulls 25 fourth quarter points as they’ve become the mainstays for the Bulls offense. Yes, Joakim Noah. And the Bulls probably didn’t go to him enough, especially in the first half when he had four points. Yes Boozer got going and had 10 points on five of six shooting in the first quarter. It was a good recovery for Boozer, though the Bulls were overrun and trailed 33-27 after one. Another conundrum for a game plan is the way the Bulls have to play. They’d like to run and score in transition to get easier points, but that wide open game if not careful with quick shots leads to fast breaks the other way and easy scores for the opposition. With Boston somewhat small and Noah having a size advantage and growing confidence offensively, he could have been more of a weapon. Of course, listen to me. Advocating more shots and offense to go through Joakim Noah? Let me think about that a bit. Robinson did have 11 points and seven assists, but it was one of those games where he just was overwhelmed on the defensive end. I know Thibodeau likes to say if you’re in that uniform you can do the job. But Nate’s a reserve generally used to spark a team in short bursts. The Bulls now are asking him to start, run a team and then replace one of the league’s best defensive point guards. So the Bulls have to hope Hinrich returns soon with Goran Dragic, Chris Paul, impressive rookie Damian Lillard and Jeremy Lin on this trip. I suspect with Teague’s strong finish with all his points in the fourth quarter he’ll see more time on this road trip. Though the Bulls still do need Robinson’s offensive abilities. As well as Hamilton’s and Marco Belinelli’s. Neither of the two shooting guards got much going in limited playing time Monday and combined for 13 points on five of 14 shooting. The Bulls early were failing to stop the ball in transition and were spread out, allowing unusually easy penetrations. One of their prime directives is creating a so called defensive shell around the paint to prevent penetration. But the Celtics were attacking like alien spacecraft with little interference. I assume alien aircraft attack like that. That got the Bulls in a 10-point hole barely more than halfway through the first quarter and the battle was on. Robinson was having issues with Rondo, which is hardly unique. But what Robinson will do if you leave him in long stretches is like when the Bulls rallied from 11 behind to within 23-18 after Boozer had a jumper and three-point play and Noah a putback. Robinson then dribbled around and lofted up a brick that went awry, stunting the momentum. Robinson does some terrific things as well with his hustle and had a steal and pass to Boozer for a score and then finding Deng for a three off the dribble. But that sort of play seemed to unhinge the Bulls. Defenses do continue to play off Noah, and while he is taking his shot somewhat regularly now, he still tends to hesitate. He’s actually playing good enough offense this season to shoot immediately when he gets that free throw line jumper and to attack the rim with his quickness, which he did several times blowing past Kevin Garnett. With Hinrich out, Teague is the backup and came in during the second quarter after Thibodeau didn’t substitute in the first. Teague, understandably, was shaky as Thibodeau is very loud and demanding of his point guard, and Teague clearly is trying to do the right thing. But sometimes when you play that position you have to pretend your hearing aide battery has gone dead. Teague has a high level NBA first step and quickness, and even if he’s missing shots I’d like to see him attack the basket more. He was late in the game and getting to the free throw line. The Bulls made up a little ground, but then fell right back behind 58-46 at halftime to a Boston team shooting 59.5 percent. The Bulls uncharacteristically were poor protecting the rim as they were spread out on defense. Gibson has continued to struggle this season. He had just four points and three rebounds in 21 minutes and hasn’t been as sharp as expected rotating defensively. The Bulls pulled within 41-38 in the second. But then Boozer had a shot blocked and Robinson a turnover that both turned into fast break scores. With Robinson directing the offense and taking some unexpected shots, the Bulls also have taken too many shots with an unbalanced floor, leaving not enough backcourt protection that Boston took advantage of with a 14-10 edge in fast break points. You should never be outrun by a team featuring Garnett and Pierce. Though Robinson did have a great pass to Boozer diving for a slam dunk late in that first half. The Bulls were getting back on defense better after halftime, and they began to apply backcourt pressure and a halfcourt trap at times, both to surprise the Celtics and seemingly wake themselves up. It finally began to take effect in the fourth quarter as the Bulls closed off the paint finally, and pushed the shooters farther outside. Garnett obliged with several misses as the Bulls scored 10 straight behind Noah and Deng to get within 87-84 with 8:23 remaining. Plenty of time, and at home. But the Bulls never could get the lead. They went scoreless for almost five minutes while Boston was missing six straight shots. 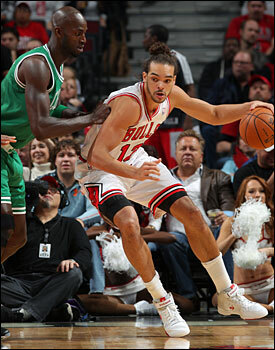 The Bulls had the defensive guys in, and Noah and Deng couldn’t score every time. Thibodeau said before the game that Rose’s rehabilitation continued well and he now was cutting, a big step — or move — in the process. But still a long way from the fourth quarter, where the Bulls most need him. Jason Terry then hit a 20 footer to give the Celtics an 89-84 lead with 4:54 left. Thibodeau finally had to give Deng rest for a few seconds, and the offense broke down. Belinelli was stuck with the ball with the clock running out and committed a turnover. Though Teague had good moments, he’s still not playing naturally, apparently uncertain about mistakes. Which is certainly understandable at 19 and how little he’s played. Deng came back in after sitting out 41 seconds — the equivalent of a Caribbean escape or leisurely cruise for him — and converted on a strong drive. He then forced a Rondo turnover that led to a Noah dunk to bring the Bulls within 91-88 with 3:33 left. But Terry hit again to make it Boston by five. Teague made one of two free throws, and then Garnett made the first of those two lob slam dunks off Rondo passes to prevent the Bulls from taking a lead. The Bulls didn’t help themselves missing five of their seven missed free throws for the game in the fourth quarter, though Gibson got a Deng miss back for a Deng layup to get within two before that second Rondo to Garnett play. Gibson then missed a pair of free throws and that was as close as the Bulls would get. The Bulls hope that’s not what they are reduced to.